“When looking at a coral reef, we are fascinated by the enormous variety of forms of animal and plant life that inhabit it. However, paradoxically for this life that is apparently inexhaustible, it is difficult to understand that everything depends on a fragile superficial layer of microscopic organisms, the madrepore polyps that multiply constantly, never stopping, indefatigably building their limy skeletons on which other madrepore polyps will grow, or where other living creatures will find food and shelter, in the eternal battle for survival”. The coral reef is one of the ecosystems with the richest biodiversity in the entire planet, even though it accounts for only 0.17% of the Earth’s surface. It is a widespread and impressive limestone formation of animal origin, characterized by thousands of colours and a number of different shapes. The organisms that are responsible for this complex biome, are the anthozoa madrepore, known as “building corals”. The corals or madrepores, consist of small polyps of variable sizes (from few millimetres to a few centimetres), surrounded by a calcium carbonate cup, which is characterized by different shapes in the different species. Single cell dinoflagellate algae called “zooxanthellae” live inside each polyp, giving them a brownish-green colouring. 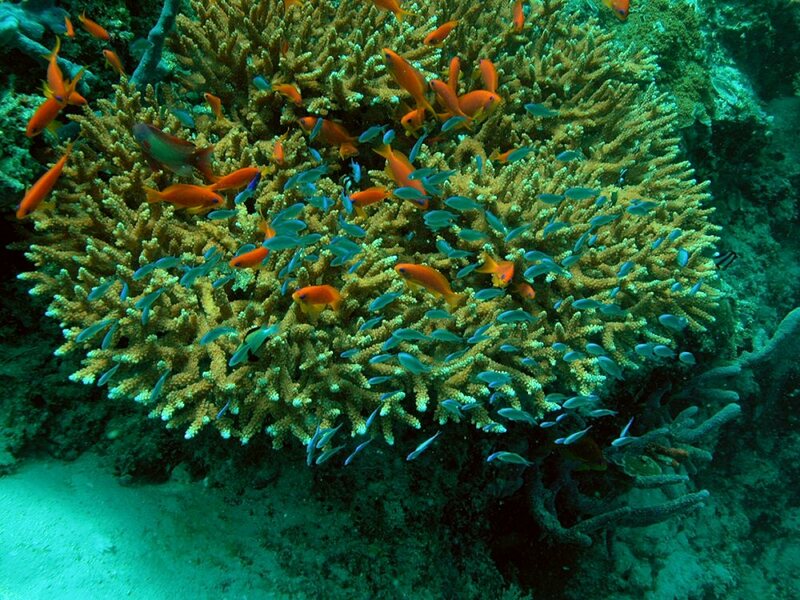 The brownish-green colouring of corals is due to the presence of zooxanthellae. This particular association is called “mutualistic symbiosis”, which means that both species draw an advantage from living together. The algae in fact, due to chlorophyll photosynthesis, provide the polyp with energy in the form of sugars, they produce oxygen and eliminate carbon dioxide (which could form carbonic acid and damage the limey skeleton of the polyps). In exchange, the host polyp gives protection to the microscopic and numerous algae that live in it. Generally corals depend greatly on this symbiotic relationship, and receive up to 90% of their energy requirement through this process. Each square centimetre of madrepore can contain up to about one million zooxanthellae algae. Coral reefs are made of calcium carbonate (CaCO3) which the coral polyps use to build their supporting structure; the polyps absorb this substance from the sea and fix it in their outer skeleton. Coral formations develop mainly between the water surface and a depth of thirty metres. the presence of a lot of light must be guaranteed. Only in these precise conditions, coral can grow and reproduce. Some species (e.g. brain coral) grow 5 to 25 millimetres a year, others (e.g. antler coral) grow more rapidly, up to 10-20 centimetres a year. The coral reef is an ecosystem that is constantly growing, because new polyps grow on the old polyps that have died, so that the part on the surface is made up of live corals. Coral reef, in a perfectly healthy condition. A pale colouring? It’s because of the stress! Bleaching is the term that is now commonly used to define the whitening of corals. In case of environmental stress (as for example a rise in temperature), the coral polyps expel the algae that live in symbiosis with the coral, the zooxanthellae, which are responsible for the colours of the corals, due to their photosynthetic pigmentation. Symbiont zooxanthellae are strongly pigmented, therefore when the algae are expelled the coral polyps appear transparent and only their white calcium carbonate skeleton is visible. The consequence of this phenomenon is a loss of colour, up to total bleaching of the coral colonies. 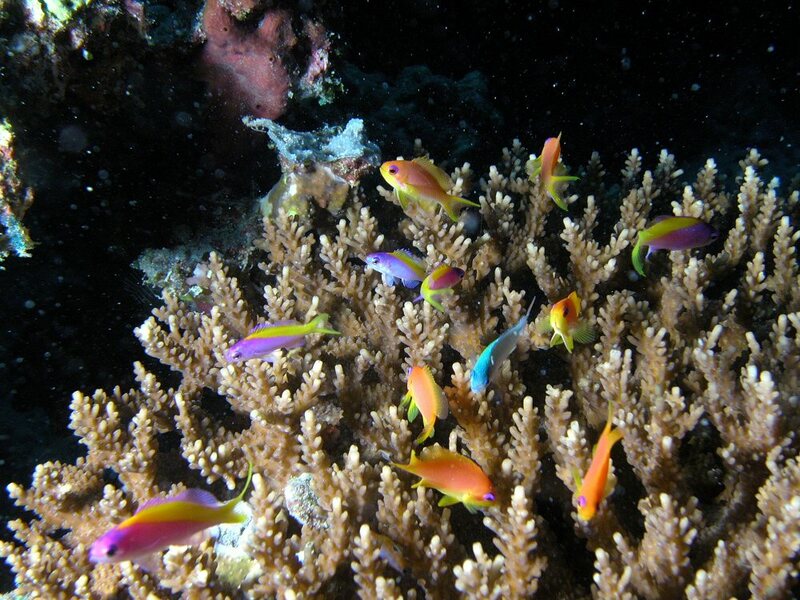 At times, in some corals, the whitening has a bluish, yellow or pink colouring instead of bright white. This is due to the proteins produced in some species of corals, which colour the tissues, and become the dominant pigment when the zooxanthellae are not present. If the cause of the stress lasts only few days, the coral will rapidly return to its normal state, if instead the condition continues for a prolonged period of time, the coral will die. It may also occur that once the whitening process begins, the polyps continue to expel the zooxanthellae even if the causes of the stress have been removed. In fact even if the coral becomes bleached, it may not be dead. If the conditions that determined the phenomenon cease, the algae will recolonize the polyps and the situation will go back to normal. 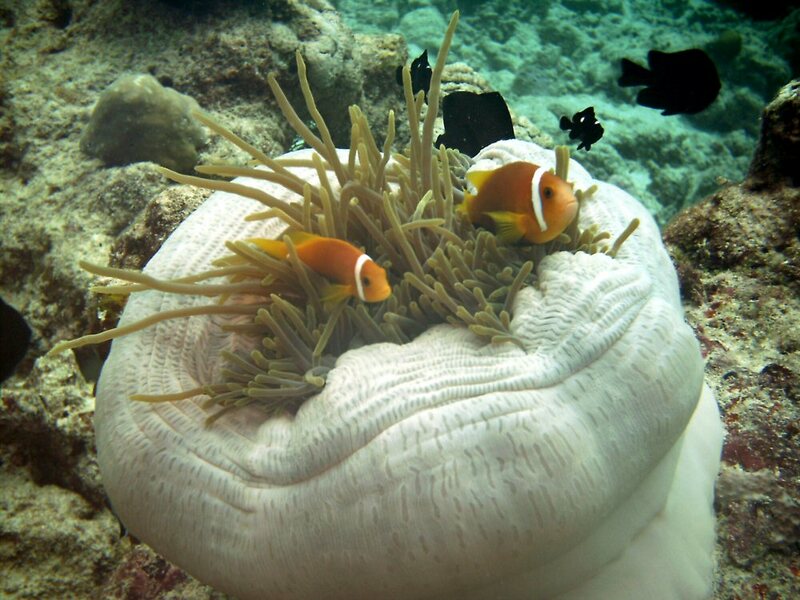 If the stress lasts for many consecutive days, it will take a long time for the concentration of the symbionts to return to a normal condition, and the coral may even die. Coral that is unable to survive, starts being destroyed, specially by the action of the sea, and also by the sea creatures, as for example parrot fish that feed on corals. In a few weeks the coral gets crumbled in this way. Furthermore the number of coral colonies decreases significantly if bleaching causes the death of the coral before it has reached a reproductive age, for example acrophores need 4-5 years to reach maturity. Changes in the reproductive conditions are probably the effects that mostly condition the distribution and abundance of coral formations. The best known cause of coral bleaching is apparently the increase in sea temperature. An increase in the temperature, of even 1-2°C for 4-8 weeks, can lead to bleaching because corals already live close to the maximum thermal threshold. The increase in temperature has been the most evident cause, up to date, of bleaching, on a global scale. However, there are other causes that influence coral bleaching. In fact this phenomenon has been noted also in the presence of other factors: increased solar radiation that increases the temperature more than normal, strong UV radiations, changes in the chemical composition of the water (in particular the salinity level following, for example, heavy rainfall), or the water opacity, changes in the currents which, as a consequence of the accumulation of sediments, can deviate warmer water from the lagoon towards the reef, coral diseases, prolonged periods of coral exposure in the case of exceptional low tides, high sedimentation rate and tropical cyclones. Coral bleaching phenomenon in an acrophore. Why do high temperatures make corals whiten? From recent studies, it has been noted that an excessively high temperature leads to a collapse in the photosynthetic system of the zooxanthellae, which leads to an increase in the production of oxygen that damages the coral cell structures. Therefore, in order to avoid high concentrations of oxygen and consequently to avoid damaging the tissues, the coral polyps are forced to expel the zooxanthellae. 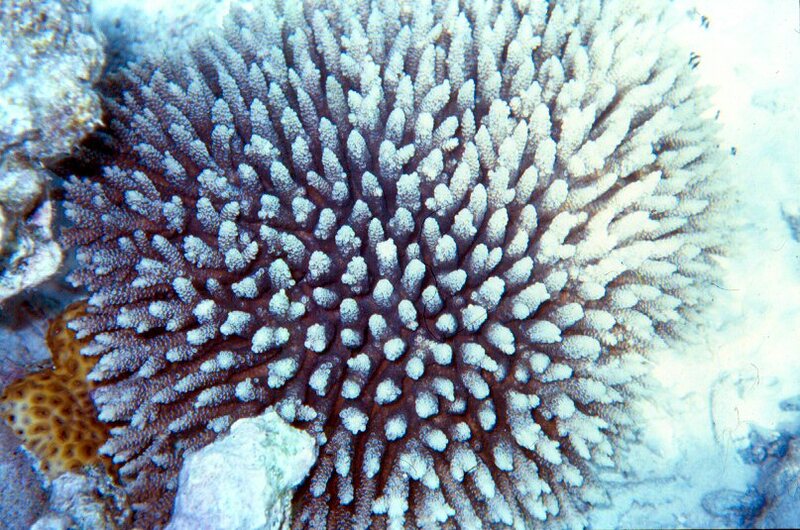 Genetic variations in the various types of zooxanthellae influence the corals’ resistance to stress caused by the temperature, and consequently can influence coral bleaching. 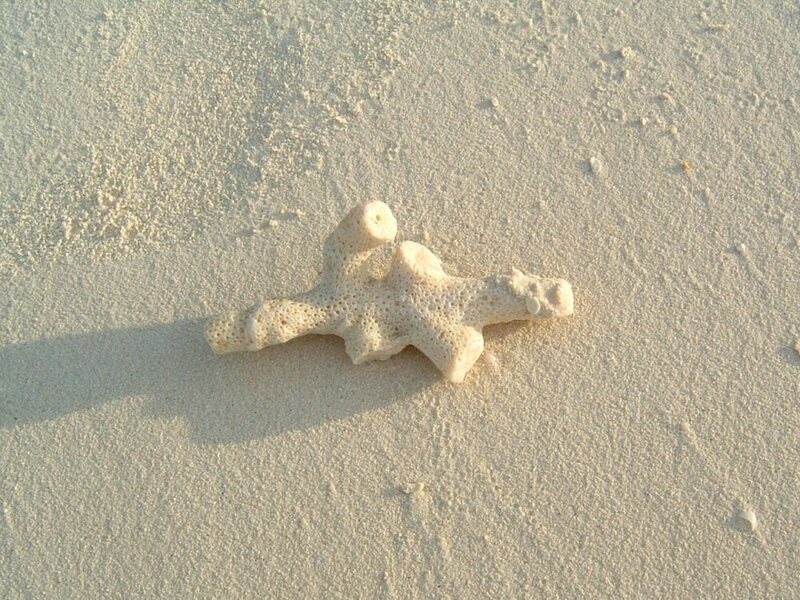 A dead coral turns white. In 1998, coral bleaching reached catastrophic proportions due to the impact of El Niño (a phenomenon characterized by anomalous movements of water in the oceans) which caused an average increase of 2°C in the temperature, in some areas of the Indian Ocean, in particular in the Maldives. Over 90% of the creatures that were symbiotic with the algae, including the corals, was bleached, specially at depths from 8 to 20 metres and in particular in some areas of the North Malé Atoll in the Maldives. The coral bleaching phenomenon was so evident that year, that people swimming near the coral reef in the Maldives would say it was like “walking on the snow clad Alps”. During that period, the surface temperature of the water was approximately 32°C, and this temperature could be recorded up to a depth of 15 metres. The concomitant lack of wind worsened the situation because there was no cooling effect on the water surface. In particular, the data that were collected pointed out that the coral branches in the first 10 metres below the surface recorded losses around 90% in 1998. The total coral cover which was initially about 40% dropped to 2-3%. It was if suddenly a forest fire had broken out in a millennial forest, the damage was not only ecological and biological with a decrease in the biodiversity, but also socio-economic, for all those populations whose survival is tied to the coral reef. 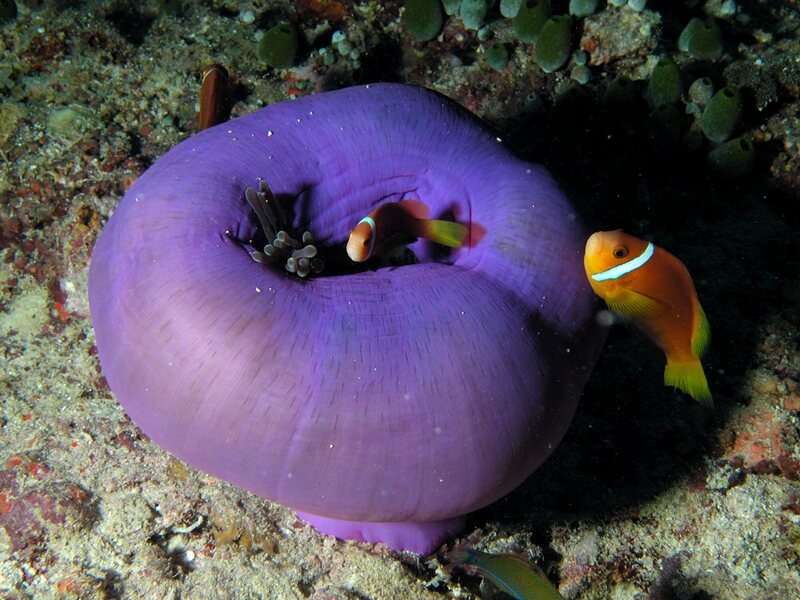 Loss of colour also occurs in other organisms that live in symbiosis with the zooxanthellae. In the first picture you can see the beautiful colour of the Heteractis magnifica anemone. In the second picture you can see the effects of an increase in the temperature in a specimen of the Heteractis magnifica anemone, which generally has a beautiful bright purple colour. The sea bottom in the Maldives has the richest coral structures in the entire Indian Ocean, and these are known as atolls, i.e. coral formations that surround a central circle-shaped lagoon (the word “atoll” derives from the Maldivian word “atholu” which means “a ring of islands”). These madrepore structures are usually found in deep ocean waters near ancient submerged volcanic islands. And here we can find over 66 kinds and over 100 different species of madrepores, and here about one third of the coral fish of the entire Indian Ocean live. 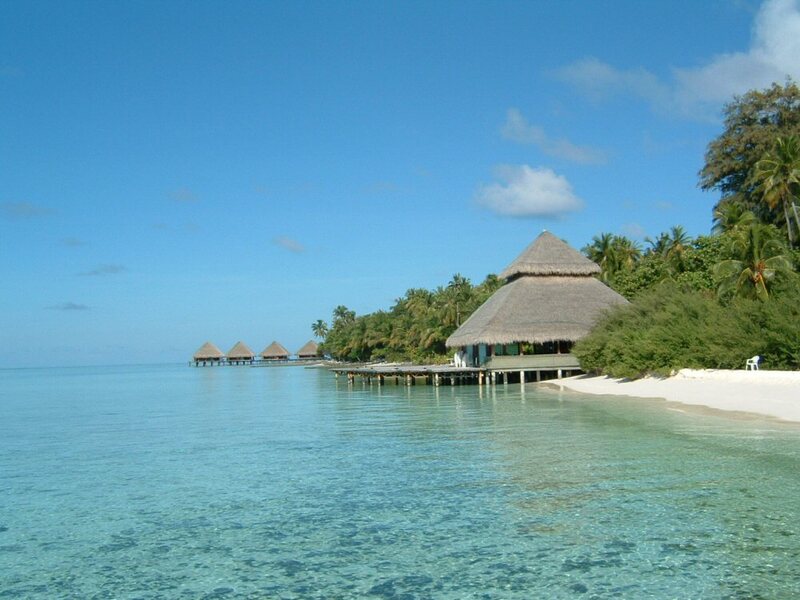 The reason for such abundance depends on the variety of environments in the Maldives. Near the reefs which rise 2000-3000 metres up to the surface, we find peaceful lagoons surrounded by pure white beaches. The reefs are broken by fissures which transform into tunnels and canyons and provide the ideal habitats which satisfy the requirements of all the species in the communities that live there. The 1998 bleaching became very important for the Maldives. In fact, the population of the Maldives, which amounts to about 270,000 inhabitants, and the economy of the Country live mainly on tourism. The coral reef of the Maldives is one of the most beautiful in the world, and therefore the greatest tourist attraction of the Country. Because of this, the number of visitors in the last thirty years has increased almost exponentially and “coral tourism” contributes to 30% of the Gross National Product. In particular tourists from Italy account for 21.2% of the total, with about 130,000-140.000 tourists per year. Fortunately immediately after the effect of El Niño in 1998, recolonization of the reef started very soon and starting from the following year coral colonies could be observed, initially the encrusting corals and later the branched corals. After 1998, however, some species that were common in the Maldives have become rare. Rannalhi, Atoll Malè Sud, Maldives. Many corals have different types of zooxanthellae in them, and can change the percentage of a species rather than another. The pigment of a coral, among its various functions, also acts as a protection for the zooxanthellae from excessive light. In many corals in the Western Pacific, there are fluorescent pigments which favour the environment for the zooxanthellae, as they concentrate light where it is lacking and protect the algae when there is excessive light. As a consequence, the corals with a high concentration of fluorescent pigment granules, are less vulnerable to bleaching in case of high temperatures. The capacity to survive the bleaching phenomenon varies among the different species of corals. Some massive corals such as the Porites lobata, can survive in the presence of high temperatures and many of the consequent effects, other corals are more sensitive, such as the Acropora spp. and do not survive the bleaching phenomenon. Recent studies have shown that the species that are subjected continuously to small stresses are able to develop a resistance to the bleaching phenomenon. In order to save the coral reefs many scientists are carrying out coral transplantation procedures, in various areas around the world. In Japan, for example, in the Sekisei lagoon an attempt is being made to make corals grow again by putting coral larvae on special ceramic discs. Scuba divers place the ceramic discs near coral formations that have survived, where the coral larvae will settle. The discs are then shifted to a protected area of the lagoon where the colonies can grow. This is a real nursery for the cultivation of coral, used specifically for transplantation, in order to prevent taking coral from the reefs, which would damage them. In this way scientists are trying to facilitate the natural reproduction of corals, offering an alternative shelter for the larvae to develop, which in nature takes place in the fissures in the rocks. When the organisms begin to grow, they are transplanted on the reef. In Israel, instead, corals are collected from other coral barriers, they are then broken into pieces of about half a centimetre in diameter, and are then glued onto any sub-layer, where they grow for about a year, protected by an underwater net. Only at that stage the corals are transplanted onto the barrier which is lifeless. The “baby corals” nursery in Israel has over 10,000 corals and various stages of growth and about 3,000 colonies have already been transplanted in the Red Sea and in other seas in Asia and in America. In Australia, researchers collect corals that are ready for reproduction and take them to a laboratory, where the corals, at the opportune time, release their eggs and spermatozoa and the marine biologists cross the gametes in order to increase the genetic diversity of the larvae. The larvae are initially made to grow in large tanks, and subsequently on an artificial reef, and finally are transplanted onto the Australian coral reef. Where, instead, the money for submarine research is scarce, as in the Philippines, unemployed fishermen led by marine biologists, detach pieces of healthy coral and shift them where the reef shows signs of suffering. Notwithstanding these different approaches in order to try to repopulate the coral barriers of the world, if the causes of the deterioration and death of the corals are not removed, the transplantation procedure will not be successful in bringing a final solution. The “coral reef” biome has many functions. In fact, the reefs are the ideal environment for the birth and growth of fry, (young fish, before they become adults) that will form the populations of adult fish in the oceans all over the world. 20-25% of the fish fished in the developing countries (approximately 10 million tons a year) lives in the coral reefs. The populations of the Pacific fish 90% of their protein requirement in the reefs. In Asia, the life of a billion people depends on the fish of the coral reefs. It has been calculated that, if correctly managed, a square kilometre of reef can supply approximately 15 tons of fish and other food per year. Furthermore, corals could be useful also in the field of medicine. The first studies on corals in fact have shown that half of the new anti-tumour drugs could come from these sea organisms. Another important function of corals is to protect the coasts. The structure of the coral reef, in fact, decreases the violence of the waves and of the tropical hurricanes. Without this protection the coasts would be damaged and also the fish and prawn farms that are spreading in the tropical countries, would be destroyed. 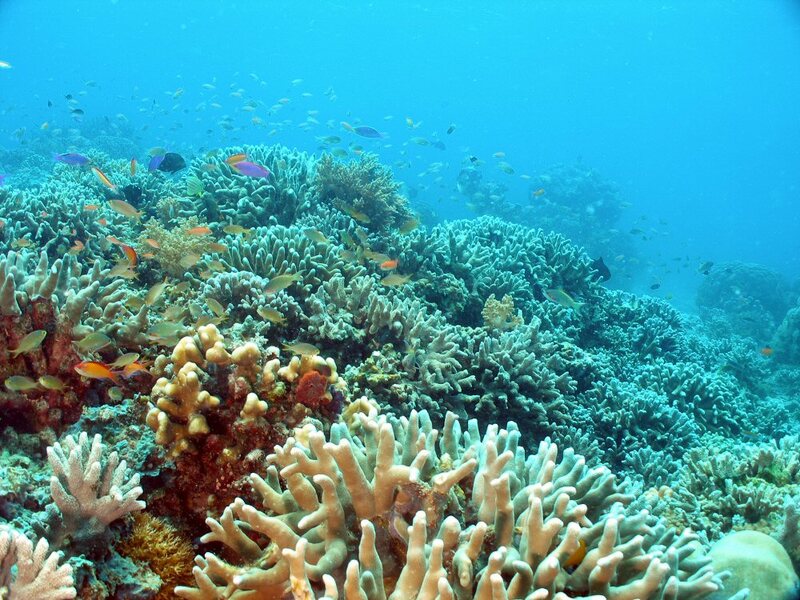 The true wealth of the coral reef, however, is biodiversity. Up to date, about 4000 species of fish and 800 corals have been classified, and it is calculated that 1 to 9 million species of vertebrates and invertebrates live and in some way exploit the reef. Today it is not yet possible to make an economic estimate of the naturalistic value of this ecosystem, however researchers are sure that the loss of species, which for the barrier have been calculated as a million species in the next 40 years, will have repercussions on the stability of the ecosystems and consequently on human life.